After a big game, with reporters huddled around in a semi-circle, professional athletes are provided with a “platform” to talk about the game, the team and themselves. At other times, athletes are given a platform when they appear on ESPN’s Sunday Conversation, Late Show with David Letterman or The Today Show. While those interviews and programs still give professional athletes an outlet, today, that “platform” has become Twitter. Just about every well-known athlete uses Twitter’s 140 characters to share thoughts, updates, photos and videos. The athletes love it, as do their adoring fans. Let’s cover ten reasons professional athletes love Twitter. 1) Their fans love it. It’s often said that we operate in a 24-hour news cycle. Like New York, Twitter is the “city that never sleeps.” Everything is in real-time and there’s a constant stream of activity, no matter the time of day (or night). In a world where content is produced by the second, fans seemingly thirst for more. Twitter helps fill that need, as fans check Twitter for updates from their favorite players. Fans also benefit from an extended ecosystem: teams, coaches, general managers, owners, sportswriters and commentators all actively use Twitter to share information. 2) 140 characters suit them. 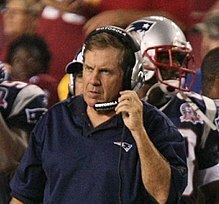 Photo source: the Wikipedia page for Bill Belichick. Sure, there are athletes who can write long-form articles. But for the most part, the brevity of Twitter suits athletes well. It’s kind of like the Bill Belichick school of interviewing: some coaches, like Belichick, already instruct athletes to answer in 140 characters or less. 3) Twitter fuels their competitive nature. Twitter’s followers and following count naturally leads to “count watching” and competition. Who has the most followers on a given team? Who’s the most followed NBA player? Whose tweets get the most retweets? You can be sure most athletes on Twitter are aware of this stuff. 4) It’s the new and easy way to break news. Shaq announced his retirement on Twitter. Alex Rodriguez (of the New York Yankees) announced that he’s ready to return to the field. No need to schedule a press conference any more. Use 140 characters (or less) and you’re on Sportscenter a few hours (or minutes) later. 5) They can conveniently follow other athletes. The “network effect” is in effect on Twitter. Athletes sign up for the service because their teammates are already using it. Athletes enjoy interacting with other athletes as much as they like to share information with the world. They also get to keep in touch and get updates from other athletes. 6) It’s great for engaging with fans. Today’s Twitter “Interactions” (mentions) are yesterday’s fan mail. Before Twitter, athletes interacted with their fans in person. Today, they interact with fans any day, any time, in short spurts of 140 characters (and often less). Athletes will do whatever they can to get a leg up. During game play, they’ll taunt other players and try to get inside the opponent’s head. On Twitter, they can do those sorts of things well before the game. Of course, this tactic may not be effective, as it often provides heightened motivation for the opponent. Sportscenter, the 11 o’clock news, CNN and many other news outlets now use athletes’ tweets as primary news sources. 140 characters can bring athletes fame, fortune, applause, respect, shame and embarrassment. The last two aren’t appealing for most athletes, but they’ll take their chances! 9) The RT is the new autograph. Pen and paper are so antiquated, right? Today, parents no longer wait in line to ask athletes for their autograph. They’ll get on Twitter and ask for an RT. The single click of the “retweet” button has replaced the signing of a ball, cap or piece of paper. 10) It’s a platform for causes, opinions and political views. Many athletes have interests, passions and causes beyond the world of sports. Their involvement in professional sports gives them recognition and Twitter gives them a platform. Twitter is a great vehicle for branching beyond sports to advance a cause, support a movement or make the world a better place.